Well hello there friends and happy Sunday to you all. It’s a happy Sunday for me for sure because it’s also kit day!!!! Hooray. My Peeps have asked for Easter Creativity Kits and who am I to refuse? You know the drill…..I get a kit too to play with and I share my projects so you can see all the fabby things I’ve created. I’m mixing it up a little and adding a banner and a slim mini album along with cards and a tag. I’ve added the usual fun and festive patterned papers and added holiday embellies like clips, doilies, ribbon and twine yards, flowers and tinsel trim. Oh and a fabby bling strip! I created these projects with the kit , some cardstock, and bits and pieces from my scrap and salvage box. You can check out this kit by hopping over to Polly’s on Etsy. Hello there and happy Saturday! Hope you are all well in this fin February morning : ) I’m dropping in to share a lovely country chic inspired greeting card. Anytime I can bring together a wood grain with a floral and a doily…. I am so there. Also this is a really sweet color combination. Has me thinking Spring….which considering how much snow we still have left outside is a long way away. I pulled these flowers to add after being inspired by the background floral pattern. There’s a companion pattern tucked under this rolled section on the top corner. It adds a lot of dimension. I hung a few sweet metal charms from a vintagy button so this card could have a little bling. More flowers here with die cut foliage layered underneath. 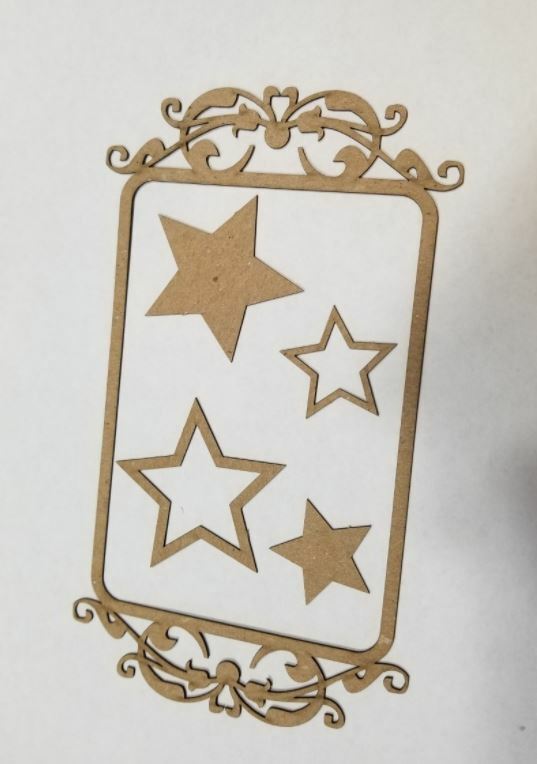 Stickles added to the die cuts is a great way to add subtle detail. The lovely sentiment is stacked over a doily image and additional paper layers. 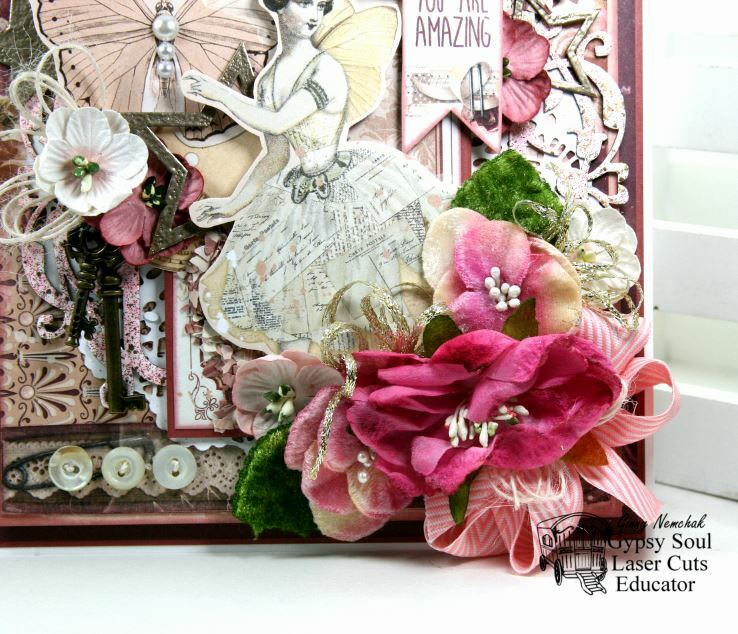 Actual vintage buttons are a last but not least embellishment on this old fashioned inspired card. Hey there Peeps! Did I mention that I love to create Valentines? I mean….I think you all have figured it out by now. So many flowers and bows and hearts…and if you’re lucky some sweet treats and snuggles. What’s not to like???? This has all the important parts right? Inspiration comes from this fabby paper collection So Loved from Photoplay. I’ve used darker matting and spacers between the layers for added depth and to keep it from looking busy. Pretty poofy bow topped with twine and a vintage button and accented with a lovely bird charm. 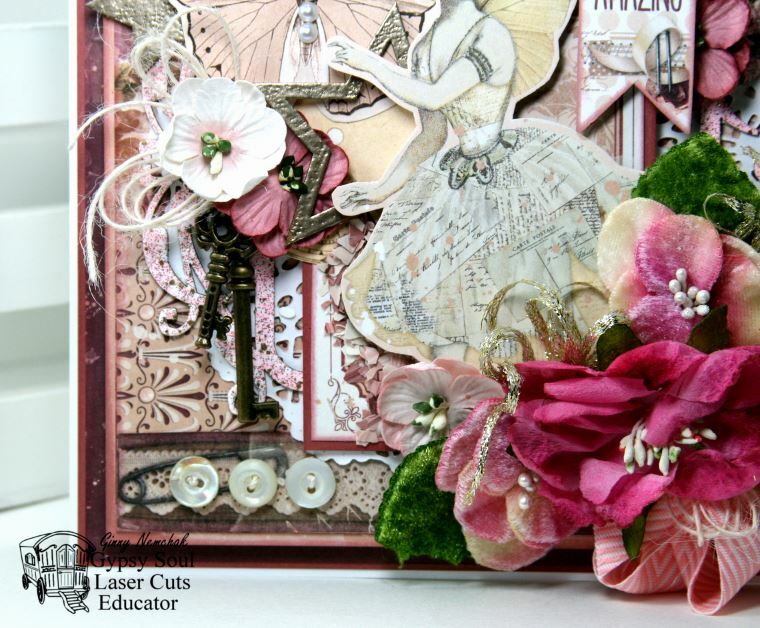 In place of my usual die cut doily I’m using an altered chipboard frame finished off in a ballerina pink acrylic paint. I’ve added a second sweet sentiment to the top and clipped it on for good measure. So. Many. Flowers. Tucking in some die cut leaves and tiny loopy twine bows builds up this arrangement and Stickling on the leaves adds just a hint of sparkle. Really Reasonable Ribbon~ Double Faced Satin Pearl Pink, Pink Burlap String, WOC Tea Roses, White Open Roses, Cherry Blossoms, Sweetheart Blossoms. Hey there my Peeps! 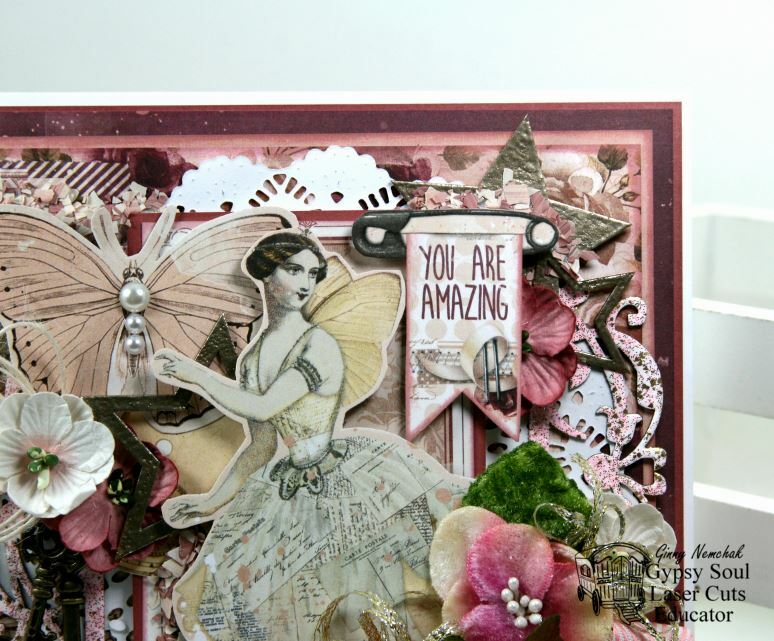 I’m taking a little break today from the Valentine projects to share a very vintagy inspired card created with the fabulous Penny’s Paper Doll Family collection from Graphic 45. This collection is so much fun to work with. Anddddd easy to layer. You all know how much I love my layers. I also love flowers. Lots and lots of flowers. Vintagy keys and buttons are the perfect accents along with a warm and richly colored satin ribbon. This chipboard frame and sentiment is finished to coordinate with the keys. The tiny clip also matches perfectly! These sweet little stamp images are popped up on spacers and help to make a smallish focal image carry a little more weight. I always like to include a few extra flowers to balance a larger arrangement. Finishing the inside of the card is the right thing to do in my humble opinion . Gypsy Soul Laser Cuts~ Flourished Frame Mikayla, Words and Phrases 1. Really Reasonable Ribbon~ Delicate Stitched Satin Sherry, Ivory Burlap String, Cherry Blossoms, White Open Roses, Sweetheart Blossoms, Trellis Roses. Hey there Peeps! 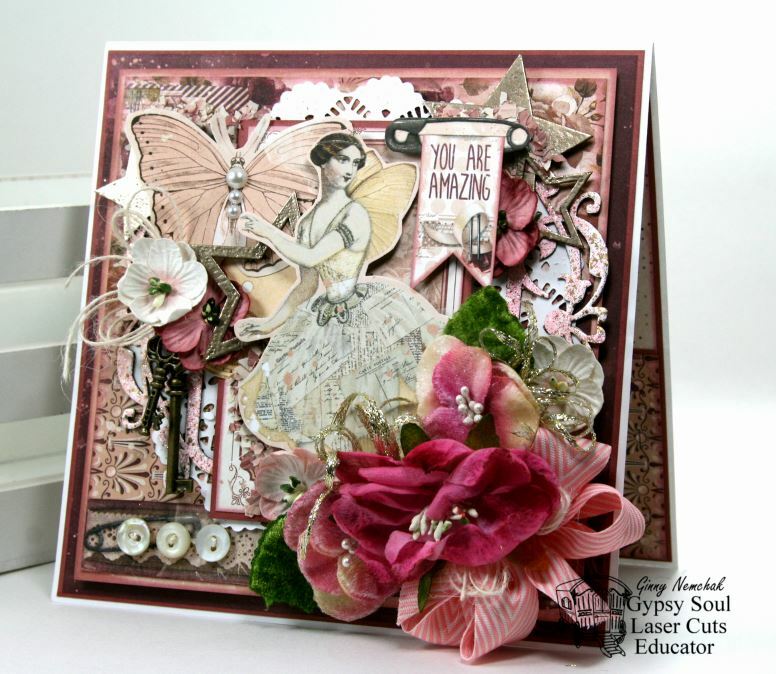 Ginny here to share a card I created with some of my fave chippies from Gypsy Soul Laser Cuts. I mean… to be fair I love all the frames. But sometimes just the right frame is the perfect addition to a project. 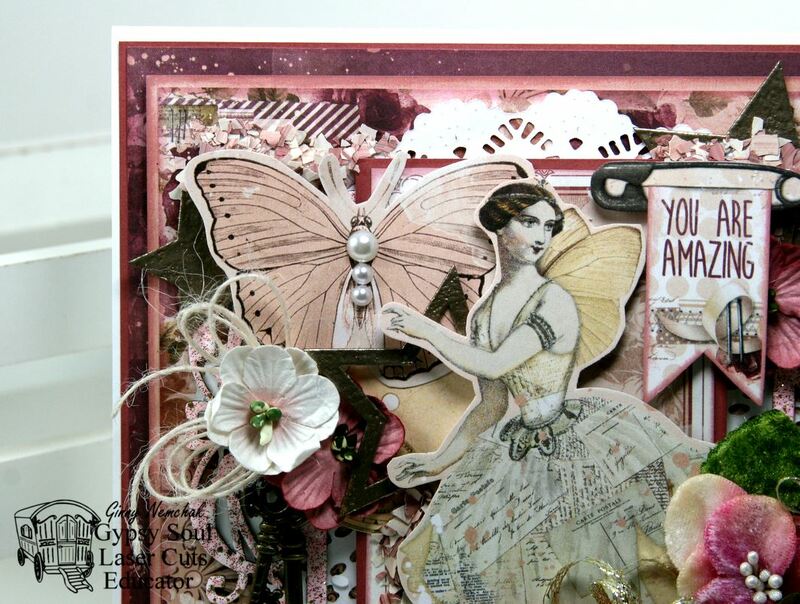 I feel like this card is so sweet and whimsical with the fairy and butterfly. The chipboard layered in creates so much depth and texture. I’ve added a few additional elements like vintage buttons and vintagy metal keys. Spacers between the layers to build up the scene and keep it from looking busy. Okay..maybe it’s a little busy…but in a totally fabulous way! A proper fairy card needs loads of flowers and I think we have the perfect amount! I’ve also tucked in some ribbon and twine to fill in this arrangement. Picking just the right chippies…. 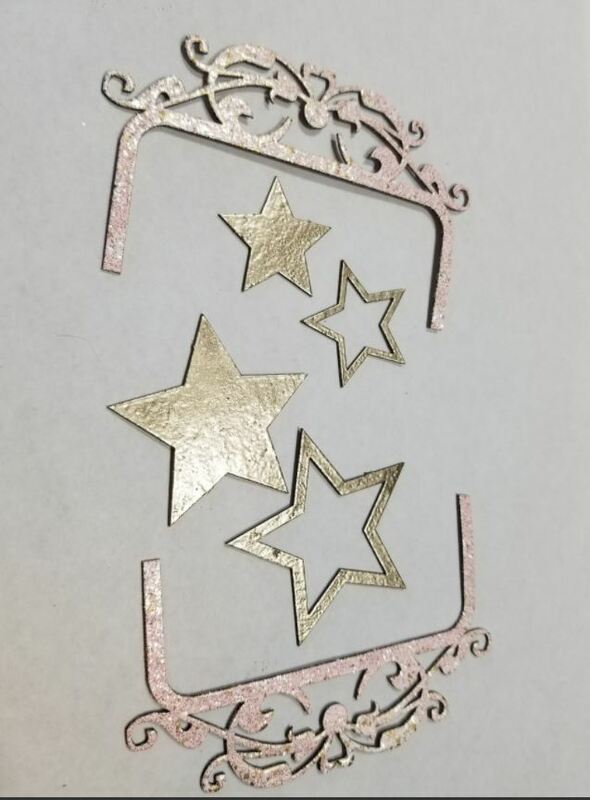 Adding sparkle to the stars with antique gold embossing powder then adding heat to set the powder. The frame is finished with pink embossing powder that has just a bit of gold flake in it. It was a bit too large so I snipped it in half to fit the card perfectly. 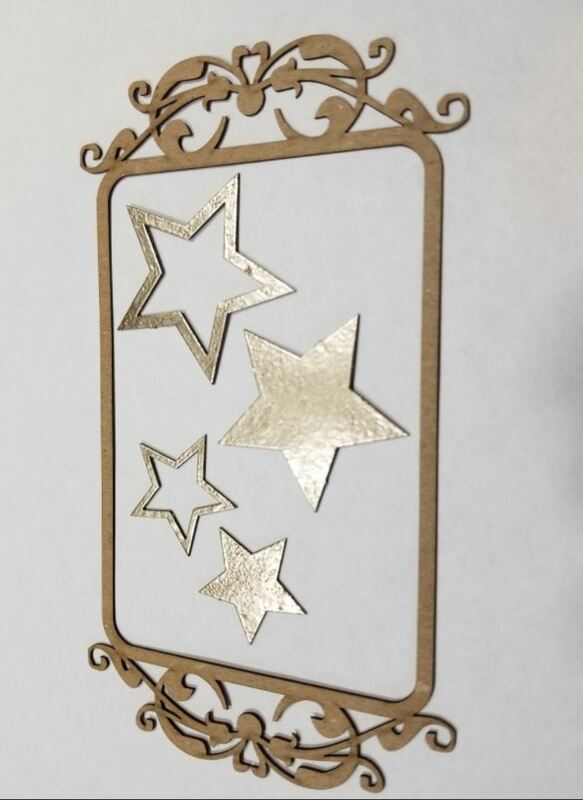 Gypsy Soul Laser Cuts~Deco Stars, Flourished Frame Lisa. Really Reasonable Ribbon~Pink Chevron Stripe on Twill.